This article we will be going over the pros and the minora cons of Pure Fix Cycle standard fixies. Live 4 bikes is an authorized Pure Fix dealer with plenty of Pure Fix in stock.Pure Fix fixies are the number one brand of fixies sold at Live4Bikes. Our store has plenty of experience and knowledge of the brand and the Pure fix business. Nonetheless, I will be as objective as possible. In my opinion I would say that the Pure Fix story is very humbling and is somewhat similar to Live 4 Bikes story. Pure Fix fixies started off with a few friends, a big idea and the love of fixie bikes. Now Pure Fix fixies are one of the most popular fixies in the Los Angeles and in many other parts of the country. With out further a do, I will proceed into the pros and cons of Pure Fix bikes. Pure fix fixies are worth every amount that you have paid or ever thought about paying. In a nut shell, Pure fix fixies are constantly giving you the best options to choose from. The variety of models can be overwhelming, from the elegant "Victor" to the classic "Juliet" and of course the vibrant glow and the dark model "Zulu". These are just a few that are apart of their fabulous collection. On the mechanical side of things, Pure fix fixies are a brand that Live 4 Bikes can and do trust The components that are used, such as bottom brackets, wheel sets and cranks and grips are high in standards and are last longing. Live 4 Bikes has found that some other fixi brands have less quality components and cause future problems. Pure Fix fxies on-the-other have never caused any issues with Live 4 Bikes and our customers. The build of the bike right from the box is easy as pie and requires minimal tools. One of the major issues with other brands are the bottom brackets and cranks. Since the fixie has few highly technical moving parts there are few things to go wrong such as there would be in a poor quality fixie such as the Walmart Thruster. From our experience, the bottom bracket and cranks always seem to go bad. As a bike store Live 4 Bikes has assembled and sold many fixies and we have found other brand that always need crank sets extra tightened or in some case the bottom bracket goes bad sooner than later. The Pure Fix fixies are a bike that come with Lasco high quality crank sets and bottom brackets that are made to last. Live 4 Bikes honors a one year warranty on all parts and lifetime labor warranty. And let me tell you, I can not remember the last time a Pure Fix fixie has been in for any major repairs other that tubes and tires. As a smart consumer, the bottom bracket and crank are the most expensive cost of any repairs. Therefore anytime you buy a bike always make sure that these two things are always nice and tight before any use. Make sure that if you are assembling the bike that they are tightened nice and firmly. If you are buying a Pure Fix from a bike shop such as Live 4 Bikes, make sure you remind your mechanic to double check each part to make sure they are nicely tighten. Now let me move on the phenomenal wheels that comes with each bike. As we all have learned the deep-v wheel’s look is what make a fixie stand out. Live 4 bikes repairs other fixie bike that have horrible wheels sets, there are plenty but none worth mentioning . What I will say as that the other fixi brands and their wheel sets always end up becoming loose or have spokes that often break. Pure fix wheels are superb and I have yet to see any major problems. Not Ideal for tricking but we will go over that later. The High tens steel frame is durable, rough and firm. Made to last and it gives you the best performance for your buck. As far as ascetics or looks Pure Fix has it nailed. Pure Fix Fixies look amazing. The best thing about Pure Fix is that they have learned what colors people like and they stick with it. You can always count of Pure fix to have in stock the colors you want and ask for. The sizes they provide are a wide variety and you can count on them to have bikes for the your little ones and for those who are 6 foot and taller. As a whole there are very few things to really say about Pure Fix but in the spirit of being fair we will mention a few. For the price point it is really hard to complain but if I were to be persistent about it one of the things I would have to mention would be the tire. The Kenda tires used on the Pure fix are entry level. One of the first upgrade that I recommend my customer at Live 4 bikes are the tires. A good quality tire in my opinion has to have 60 TPI or more and should be hold 125 PSI (Pounds per Square Inch ). TPI are threads per inch, this another topic that we wont get to much into, but basically the more threads per inch the better. We find that the Kenda tires are an over good size and feel but for those that want to get more out of the bike, the first thing to do would be is to get into some good tires. We recommend the Serfas tire, they are at a great price and if you want to get into a well known brand the Continental or the Freedom Silks and a 700x23 size is what I would recommend. The higher tire pressure the greatly improvement on your speed and tube durability. To be fair it is worth mentioning that this is an issue that is common on all fixies at this price point. Its not until you get into the $800 + that one can expect to get top of the line stock tires. Moving on, the drop down bars are offered on the Pure fix site and at Shop.live4bikes.com, but Pure Fix should also have fixie bikes that comes standard with drops . Keep in mind these changes are for those who are looking to get the most speed out of the bike and we are only reviewing the Pure fix standard Fixie bike. On the other hand, those who want to get into freestyle trick fixies, Pure fix offers a bike that is perfect for that. Finally, an overall safety tip on all bike is to make sure that you have regular maintenance inspections and tune-ups. By making sure your fixie has the correct air pressure, tights cranks, pedals and all the bolts you can increase the life of your Pure Fix bike. But enough about specs lets move on to the real reason you are reading this. If your doing your due diligence and research on a fixie bike and brand here is why you should buy a Pure Fix from Live 4 Bikes or at any other bike store (but preferably from Live 4 Bikes). 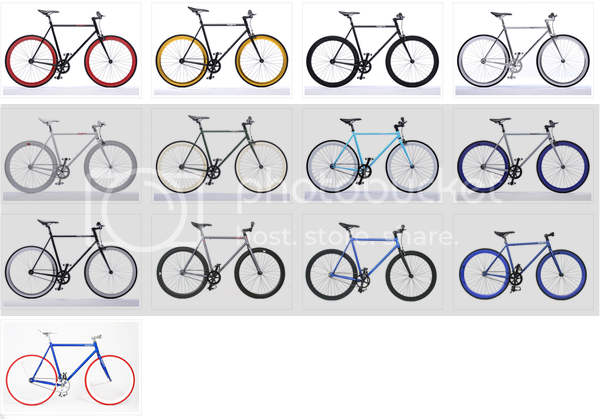 In all honesty, most brands of fixie bike at this price point are going to have some similarities. The most important things to really evaluate is that your bikes come with a warranty, customer service and integrity of the business you buy your Pure fix from. The Pure Fix company has always been good to Live 4 bikes when it come the warranties we needed help with. Live 4 Bikes has impeccable reputation of having amazing customer service so with these two combinations you cant go wrong with a Pure Fix fixie from Live 4 Bikes. With all honesty , buying a Pure Fix Cycles Fixie will be in your best interest . The over all quality and style of all of the Pure Fix Cycles fixies are immaculate. Live 4 bikes stands behind the brand %100 and highly recommend your buy your today because of the quality and integrity of the company and Bikes.